Kironadal’s name was believed to have been derived from the two B’laan words koron or kolon meaning cogon grass, and nadal or datal meaning plain which aptly described the place to the natives. Native settlers at that time were the B’laans and some of the Maguindanaos. It was on August 18, 1947 when President Manuel Roxas signed the Executive Order creating the municipalities in the entire province of South Cotabato, one of which was Koronadal. The same order likewise mandated the official function of the municipal government which began after the qualification and election of the first municipal official. Koronadal was converted into a component city of South Cotabato, now known as the City of Koronadal by virtue of Republic Act 8803 on October 8, 2000. At present, Koronadal is a fast developing growth center composed of twenty seven (27) barangays including the four (4) zones in the poblacion. Being the capital city of South Cotabato, it is the center of the province in terms of political, cultural and socio-economic activities. The people in Koronadal City are comprised of the people speaking Hiligaynon language, which comprised of 80% of the population. Twenty percent of the population speaks Cebuano due to its proximity in GenSan and Davao City. There are also others who speak Tacurong. The city is not a sectarian city thus making the Christians and the Muslims live together in harmony. Koronadal City is comprising a total land area of 284.25 km2 (109.75 sq mi). 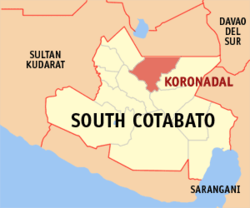 Koronadal City is located on the northern part of South Cotabato province in Southern Mindanao. It is the seat of the provincial government of South Cotabato and one of only two cities of the province. The other is General Santos City. The city is bounded on the northwest by the town of Tantangan, on the northeast by Lutayan, Sultan Kudarat, on the southeast by Tampakan town, and on the southwest by Banga town. The city is situated on the southern part of the great plain of Central Mindanao. Mountain ranges however, defined the city’s terrain in the east and in the southwest. Located amidst a wide expanse of agricultural fields coupled with its proximity to the markets of General Santos City and neighboring towns, this city is an ideal location for businesses ranging from small to large enterprises. It is a good location for a provincial or regional branch. Investing in real estate business maybe a good deal particularly medium-size sudivisions, commercial complexes, and industrial zones. Tourism-related ventures such as hotel and golf course are good bets considering its proximity to the tourism spots of nearby provinces. Hinugyaw Festival – this festival celebrates every month of January and it coincides with the foundation anniversary of the city.